Leading CD DVD burning software for CDs DVDs Burning, burn data, audios, videos, and images to CDs or DVDs super easy, one of the best CD DVD Burning program for you ! 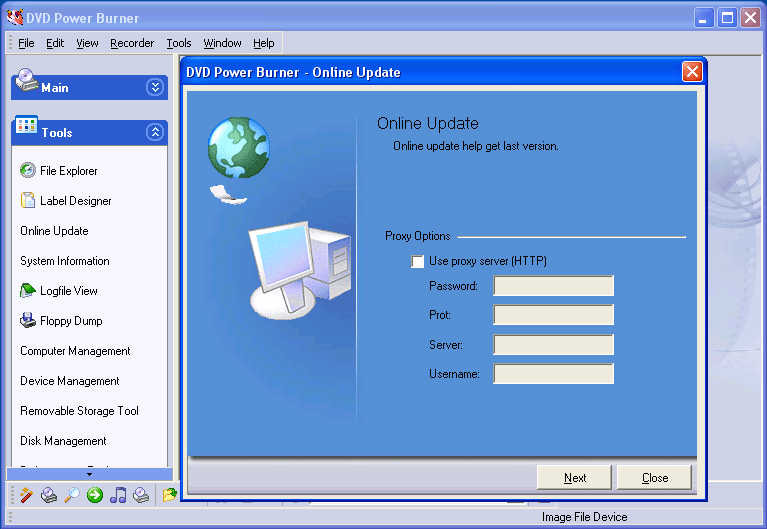 CD DVD Buring - DVD Power Burner is leading CD DVD burning software for burning DVDs CDs, burn data, audios, videos, and images to CDs or DVDs easily. Enhanced writing stability increases synchronization and the compatibility with other application programs and software for CD DVD burning. User-friendly interface and step-by-step wizards make every beginner experience expert's CD DVD burning skills. LESS time and MORE fun! CD DVD Burning - DVD Power Burner is also a professional and innovative CD DVD buring tools and utilities are designed to satisfy your needs. It's more convenient to compose Music CDs than other CD DVD burning software. Forget about any extra CD DVD software for sound track capture, format conversion, or audio compression. 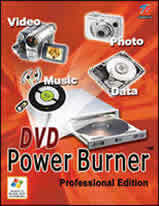 Power CD DVD Burner provides one-step solution to make an ideal music album you need. Backup your favorite or important data from computer hard drive for future use. Manage your own digital photos, videos, and songs to make a multimedia CDs DVDs and play it on your player whenever you like. Save and burning data to CD DVD or make bootable disc easily and quickly with CD DVD Burning Wizard. Multi-section writing mode makes burning work more flexible. Assign a section to save data automatically or manually. Users are able to create any kind of CD DVD image files from source discs and then copy them to other discs later. Support various popular CD DVD label formats to design individual label with included image library or editing your favorite pictures. Print out your labels using a printer. CPU (Processor): Pentium class CPU. RAM (Memory): 64 Mbytes of RAM or above. There are different requirements of RAM on different operation systems. Therefore, it would be better to have a larger memory capacity. Hard Drive: Hard drive with 1 GB capacity or larger. It requires about 700 Mbytes free space preserved to store images. Most hard drives now have at least 10 GB of disk space, the larger the better. The recommendation for hard drive rotation speed is 4200 RPM or faster. SCSI Card (Optional): It's not necessary, if you use an IDE interface CD/DVD burner. Operating System: Windows 9x, Windows ME, Windows NT, Windows 2000, Windows XP or Windows 2003. There is no limitation on the language version of the operating system. CD/DVD-ROM drive: Any CD/DVD drive that can be detected by our powerful CD DVD Burning software. CD/DVD R/RW burner: Any one that can be detected by our powerful CD DVD Burning software. Installation Capacity Requirement: You need about 10 Mbytes of hard disk space to install DVD Power Burner only. If you want to install the additional bonus tools such as CD Label Designer, you need 25 Mbytes of hard disk space. Online Help: You will need Microsoft Internet Explorer 5.0 or above to run this program. Otherwise, you cannot query or use CHM Help files under Windows. WinAVI Video DVD Converter - Solution for video converting and burning AVI Mpeg DivX to DVD VCD SVCD easily. Hot!